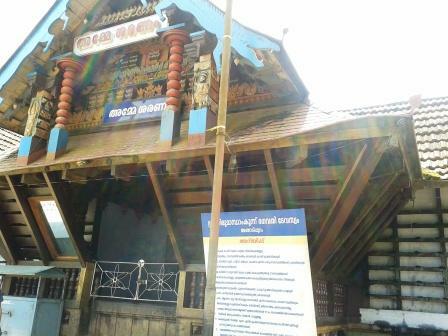 Thirumanthamkunnu Temple is one of the most important temples of Kerala, South India. It is a historical temple located majestically ,with an imposing appearance, on a 60 ft hillock at Angadipuram (near Paerinthalmanna) in Malappuram District of Kerala. 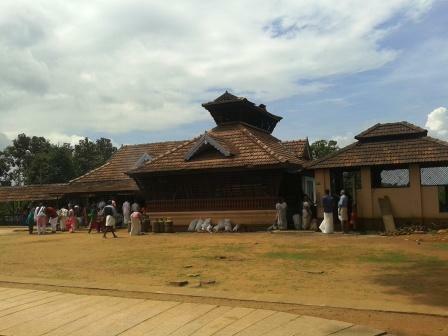 The temple is historically significant and an important pilgrim centre of Kerala. The deity is Thirumanthamkunnilamma, the para devatha of Valluvanad Kings, who were the rulers of this area during the middle age. The principal deity of the temple is Lord Shiva. 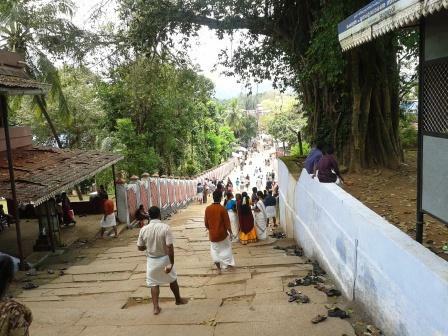 Bhagawathi known as Thirumanthamkunnilamma, and Lord Ganapathi, are other important deities here. According to the legend, King Mandatha of Surya Dynasty, ruled the kingdom for a very long time. Then the king decided to meditate on Lord Shiva and attain the Lord's feet at the end. He gave away his kingdom to his successors and proceeded on his mission. Lord Shiva was pleased with his devotee's penance and appeared before him, and asked him to ask for any boon. The king wanted only an idol to worship till his end. Lord Shiva granted his devotee's boon and gave him the most holy Shiva Linga of Kallas, which was also very dear to him and his consort Parvathi, who was at that time away for her bath. Mandatha carried the holy idol on his head and proceeded on his return journey. When he reached the hilltop, known as Thirumanthamkunnu, keeping the idol on the hill he decided to take some rest, enjoying the scenic beauty of the place. He was shocked to find the holy idol was stuck to the earth and he could not take it from there. When Parvathi returned after bath she searched for her favorite idol to worship as usual, but it was not there. Knowing that it was gifted to the king by Lord Shiva, she became very furious, and with his permission, she sent Bhadrakali and other bhoothas to bring back the idol from Mandatha. The brightness emitted from the linga was so great that it dazzled the eyes of his opponents (kali and bhoothas) and they were unable to move up the hills. Then they used the Attanga nuts which were plenty there to throw at the king, but they were turned to be arrows, and still they fought for 15 days. The Goddess took her viswaroopa, and came to the hilltop to take the idol. Seeing her, Mandatha became helpless and embraced the idol with all his force not to give it away. In the struggle, the idol got split into two. In the “Jyothis” that arose from it “THRIMOORTHIS” (Brahma, Vishnu and Siva) and Parvathy appeared on the spot. As Parvathi didn't to get to get separated from her husband, she offered to enter in the linga and stay there permanently. Thus, the sivalinga seen here is still in split condition , positioned below the “peedam” and “Prabhamandalam” and can be seen only during the Abhisheka before the Ushapooja and “Malarnivedia” to the deity. After each pooja, the door is kept open for some time. Two openings are there in either side of the doorways and the devotees have darshan through these, when the door is closed. Offerings: There are several types of vazhipadu done in Thirumanthamkunnu Temple, and pujas can be booked online. too. 1) The six feet idol is made of Daru (wood) in a sitting posture with the left leg on her lap and the right hanging as usual and touching the ground. In one hand, she holds the head of Darika, and weapons in her other seven hands, giving a fierce appearance. 2) Many rituals and conventions which are not carried out in other temples, are done here. 3) A ritual is enacted on the particular day in October when two groups, one at the bottom and another at the top of the hillock, throw a fruit (Attanga) at each other. The idol of this temple is almost identical with that at Kodungallur Bhagavati temple, but the Angadipuram idol is taller. Due to this, the Angadipuram Thirumandhamkunnu Bhagavathy is considered the elder sister of Kodungallur Bhagavathy. Pooram (lasting for 11 days in March-April) in Meenam. We went from Guruvayur to Angadipuram by bus which took 1 1/2 hours and from Angadipuram took an autorickshaw for about 10 mts. travel. Angadipuram is located 3 km from Perinthalmanna, off NH 213. By Air: The airports are Cochi, Thiruvananthapuram and Calicut.